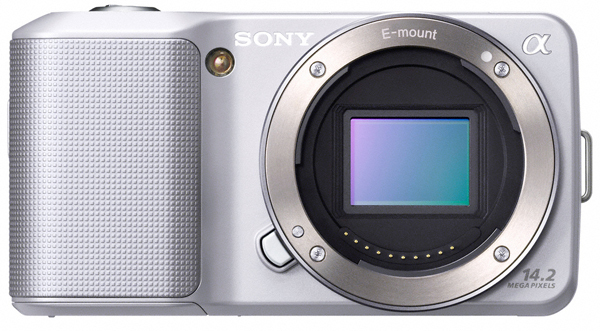 During PMA 2010, Sony unveiled several new concept models under glass, including some EVIL (Electronic Viewfinder Interchangeable Lens) units that looked like direct competitors to the popular Olympus/Panasonic Micro Four-Thirds cameras. 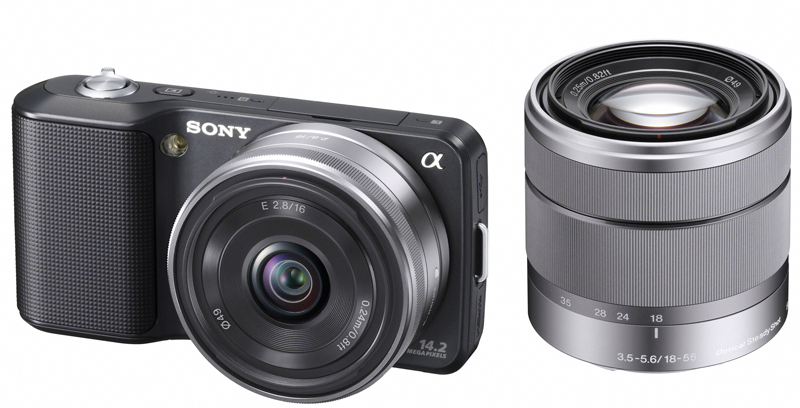 Today, Sony announced two of those models, the NEX-3 and NEX-5. The NEX label stands for Next Generation in their Alpha line of powerful interchangeable lens cameras, and these models boasts dSLR performance, HD video options, and a whole lot more in their compact frames. Both models share almost identical specifications, with only the body design and video options differing. Please stay tuned as we wait to get our evaluation unit in for testing. Below you can find the official Sony press release. 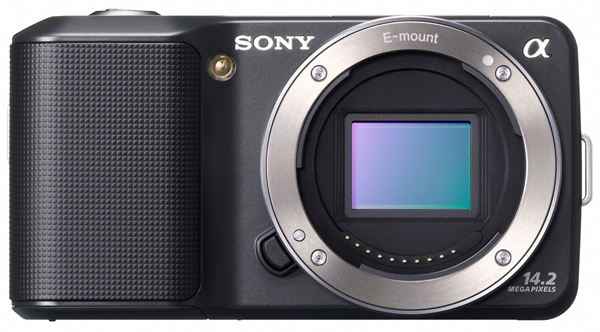 Sony has just released a new firmware update for their NEX camera models. Below are the details of Version 2. SAN DIEGO, May 10, 2010 - Sony today introduced two innovative a (alpha) compact interchangeable lens digital cameras (models NEX-5 and NEX-3) that provide the quality of a digital SLR in a compact body that is easy to slip into a small purse or jacket pocket for ultimate portability. "Consumers want better picture quality in a smaller form factor. Sony has made that a reality with these cameras. 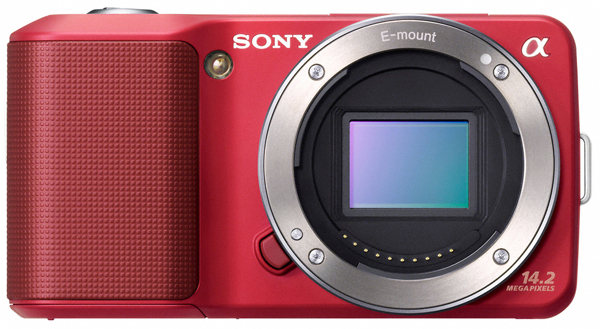 The NEX-5 and NEX-3 cameras truly embody Sony's make.believe spirit," said Kristen Elder, director of Sony's alpha digital imaging business. "These new cameras are the game-changers everyone has been waiting for and will revolutionize the consumer experience by offering outstanding picture quality with a totally pocketable size." With breakthrough video performance, these models are the world's first interchangeable lens cameras with an APS-C sensor to continuously adjust focus and exposure while recording video. The NEX-5 camera offers Full HD movie capture (1080i AVCHD and 720p MP4) with Full HD 60i recording. Unlike conventional DSLR models, the "mirrorless" construction of the new models reduces the thickness of both camera bodies to just about an inch at their slimmest point (excluding grip and mount portions). The NEX-5, constructed from magnesium alloy, and the NEX-3, with a polycarbonate casing, offer a newly developed 14.2 megapixel Exmor™ APS HD CMOS sensor. About 60 percent larger than the sensor in micro four-thirds cameras, this sensor is key to the exceptional image quality, extremely low image noise and creative defocus background effects that are familiar to DSLR users. Full HD (1920 x 1080i) video in high-quality AVCHD files that can be easily enjoyed on a compatible HD television via the cameras built-in HDMI™ terminal (cable not included). 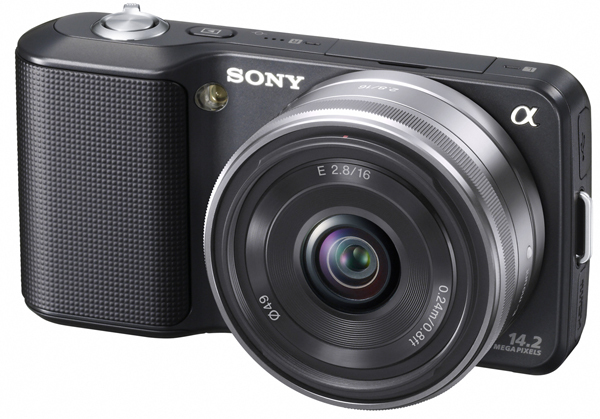 The NEX-3 shoots 720p HD video as compact MP4 files. Both Sony cameras include built-in stereo microphones for high-quality audio recording. Still and video image quality is further refined by Sony's powerful BIONZ® processor that ensures quick DSLR-style shooting response with fast, precise autofocus and minimal shutter lag. Both cameras can also capture fast-moving action with a high-speed burst of full-resolution images at up to 7fps (AF/AE fixed from first frame). The NEX-5 and NEX-3 are the first a cameras featuring Sweep Panorama. Capturing large group shots is as easy as press-and-sweep. Sweep Panorama mode lets consumers capture breathtaking shots up to 226-degree horizontal or 151-degree vertical shots. These cameras provide the advantages of multi-frame capture featured in Cyber-shot® cameras, including Hand-Held Twilight and Anti-motion Blur modes, which offer extraordinary low-light performance. Overcoming the complexity and intimidation that often come along with DSLR use, the NEX-5 and NEX-3 cameras have a new easy-to-use interface. It makes their performance advantages and features--including the techniques of creative photography--simple to master for consumers stepping up from compact digital still cameras and simultaneously offers easy access to the important camera controls that DSLR users demand. Images and camera settings are displayed on the 3-inch (diagonal) wide-type Xtra Fine LCD™ display with TruBlack™ technology and 921k dot high resolution LCD that tilts up or down for comfortable viewing in any shooting position. The screen features an auto-brightness control function for excellent visibility, even outdoors. TruBlack screen technology enables an even more vivid, high-contrast view of images and camera settings. The E-mount lenses provide the cameras with extreme compactness as well as the performance required for quiet continuous auto focus and auto exposure during HD video capture. These all new lenses are of premium construction, with brushed aluminum barrels and steel mounts. An optional LA-EA1 Mount Adaptor extends compatibility to the a family of 30 lenses, plus a huge range of other legacy A-mount lenses (Manual Focus only). As an option, the accessory shoe on both cameras accepts a compact ECM-SST1 Stereo Microphone that captures even more high-quality sound for HD video recordings than the cameras' built-in stereo recording. The new cameras accept both Memory Stick PRO Duo™ (including Memory Stick PRO-HG Duo™) and SD (including both SDHC and SDXC formats) media (all sold separately). Sony's new Memory Stick PRO-HG Duo HX offers 30MB per second transfer rates that save you time when downloading images. The cameras, lenses and a range of accessories will be available in July at Sony Style® retail stores (www.Sonystyle.com/retail) and at authorized dealers nationwide. *The NEX-5 and NEX-3 cameras are the world's smallest and lightest interchangeable lens digital cameras as of the announcement date and based on Sony's research.